The second 2017 MN generation of thistle caterpillars continue to cause concern in some soybean fields. Most of the reports of Minnesota high populations are from SW, SC, C, and the WC part of the state. There are several action thresholds for thistle caterpillar control. On larger soybeans, like those we have now, it is still probably best to use the 20% defoliation guideline rather than numbers of larvae. That said, numerous larvae/plant might cause me to pull the trigger at a bit less defoliation. While the larvae are very abundant and there are scattered reports of insecticide treatment in heavily infested fields, be cautious in your decisions to treat. 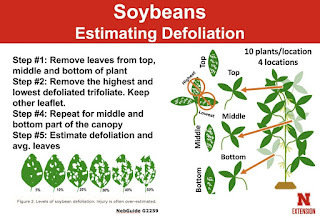 Defoliation damage from multiple insect species can be combined when making a treatment decision. On the other hand, do not treat insects causing damage other than leaf feeding, soybean aphids for example, at a lower threshold just because you are finding a few thistle caterpillars. 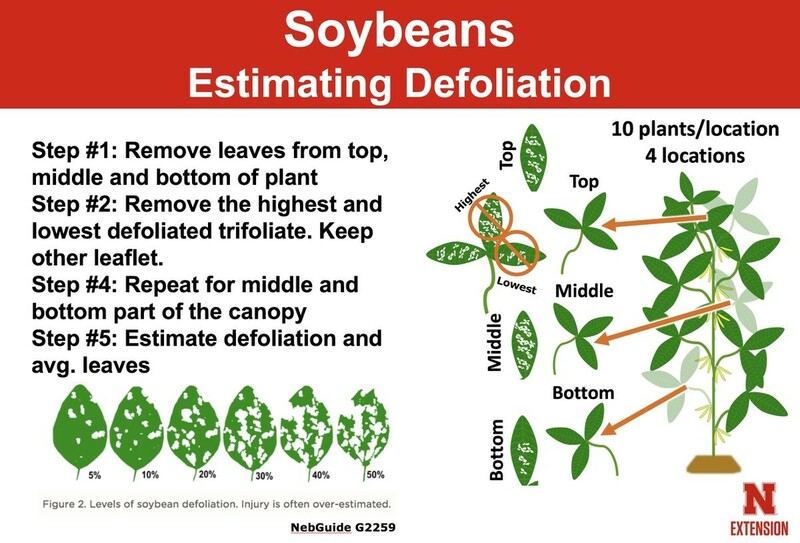 The University of Nebraska recently developed a nice illustration on how to assess insect defoliation in soybeans. It helps prevent focusing on the worst plants and leaves. Once you get yourself calibrated you can determine potential problem fields very quickly. Size of the larvae – Mature larvae are approximately 1.25 inches long. Most of the feeding is done by the large larvae; however, if most of the larvae are full grown, or if you see chrysalis in the field, damage may be ending. Make sure insects are still present in the rolled and webbed leaves. The thistle caterpillar’s preference for the upper canopy and webbed leaves makes them very visible, and it is very easy to overestimate defoliation. Area affected – If the larvae are mainly on field edges or in a particular area of the field, you do not need to treat the whole field. 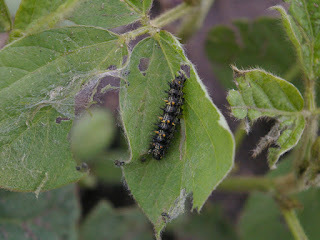 Larvae are usually concentrated on the upper part of the plant and not that difficult to control. Use a labeled insecticide at a labeled rate.